Vascular dementia (VAD) accounts for one-third of all dementias in today''s aging population, second only to Alzheimer's disease (DAT). Fortunately, current imaging techniques allow clinicians to view specific lesions in the brain, classify them by etiology and anatomical location, and assess changes using serial imaging, while at the same time correlating those changes with signs and symptoms of VAD or DAT. In 17 chapters, this book summarizes new concepts concerning the epidemiology, etiology, risk factors, neuropathology and pathogenesis of VAD and DAT, and mixtures of the two, and reviews their multiple causes, including microvascular and hemorrhagic lesions, and ischemic and inflammatory changes affecting both white and gray matter. John Meyer is the editor of Vascular Dementia, published by Wiley. 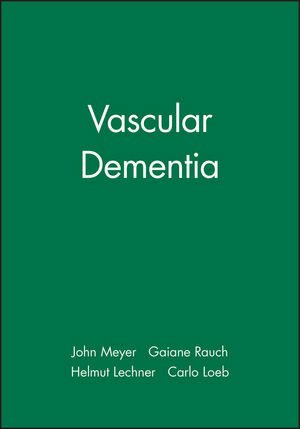 Gaiane Rauch is the editor of Vascular Dementia, published by Wiley. Helmut Lechner is the editor of Vascular Dementia, published by Wiley. Carlo Loeb is the editor of Vascular Dementia, published by Wiley.